A regular breeding resident and migrant in Minnesota, the Palm Warbler was uncommon during the Minnesota Breeding Bird Atlas (MNBBA). Patchily distributed from far eastern Canada to northern Alberta, including northern Minnesota, the Upper Peninsula of Michigan, northern Wisconsin, and northern Maine in the United States (Figure 1). A substantial part of its breeding distribution is not shown in Figure 1 because of the lack of roads in northern Canada. Short- to long-distance migrant that over-winters along the Atlantic and Pacific coasts, southern United States, south to Mexico and Central America as well as the Caribbean. Insects gleaned from the ground and foliage. Cup-nest on the ground and typically in Sphagnum moss. Breeding distribution and relative abundance of the Palm Warbler in North America based on the federal Breeding Bird Survey from 2011 to 2015 (Sauer et al. 2017). Roberts (1932) called the Palm Warbler a “rare summer resident” in the northern part of the state as far south as northern Aitkin County and west to the “evergreen groves of eastern Marshall County.” He identified nesting activity in Aitkin (nest with egg and three young), Cook (immature bird observed), Marshall (three young in juvenile plumage), and St. Louis (nest with half-grown young) Counties as well as at Cass Lake (two adults and two young). Roberts described the Palm Warbler as rare primarily because of the lack of observations, or at least consistent observations, during his field trips to many of the northern counties. For instance, he collected one specimen, the only one he observed, during a number of days of observation around Lake Vermillion in northern St. Louis County. He described similar experiences with limited or a lack of observations during prime breeding periods at Lake Itasca, Cass Lake, Burntside Lake (St. Louis County), and Lake Vernon (Cook County). Roberts cited observations by Dr. Dart that the Palm Warbler was “well represented in the dense, evergreen swamps then existing along the Moose River and about Mud Lake in northeastern Marshall County, some forty miles south of Lake of the Woods.” He summarized that it “is a summer resident over a considerable area in northern Minnesota and that it there inhabits, at that season of the year, densely wooded evergreen lowlands.” This habitat description is quite different than the open peatlands where it is primarily found in Minnesota today (see below), but little descriptive or quantitative data were available for comparison. In 1975, Green and Janssen emphasized the Palm Warbler’s breeding distribution as the northeastern and north-central regions and in adjacent Marshall and Roseau Counties. They described the Palm Warbler as scarce throughout most its range except where “extensive areas of open or parklike tamarack-black spruce bogs” are present. Nesting was confirmed only in Aitkin and St. Louis Counties. Several years later, Janssen (1987) illustrated a much more restricted breeding distribution from west-central St. Louis County to eastern Roseau and Lake of the Woods Counties, including portions of Aitkin, Beltrami, Cass, Itasca, and Koochiching Counties. Janssen only reported confirmed nesting since 1970 in Beltrami County, but Hertzel and Janssen (1998) later only included confirmed nesting since 1970 in Koochiching County and did not include Beltrami County. The Minnesota Biological Survey (MBS) recorded 249 breeding season locations and greatly expanded the breeding distribution reported by Janssen (1987). The MBS detected the Palm Warbler from northern Carlton and Pine counties, throughout Aitkin County, eastern Marshall County, and throughout northern St. Louis, Lake, and Cook Counties (Minnesota Department of Natural Resources 2017). The MNBBA included a total of 356 records, which were all within the Laurentian Mixed Forest Ecological Province (Figure 2). Detections were recorded in 4.0% (191/4,736) of all blocks surveyed and in 4.7% (110/2,337) of priority blocks (Figure 3; Table 1). Confirmed nesting was recorded for 8% (16/191) of all blocks where they were detected in 6 counties: Beltrami, Cook, Itasca, Koochiching, Lake, and St. Louis. Probable nesting was also identified in Aitkin, Carlton, Cass, and Lake of the Woods Counties, plus possible nesting in Clearwater, Crow Wing, Mille Lacs, and Roseau Counties. This distribution of the Palm Warbler identified by MBS and the MNBBA expanded the breeding range identified by Roberts in the late 1800s and early 1900s. It is unlikely that the breeding range has expanded in Minnesota; more probably the many previous efforts have overlooked the species. The Palm Warbler has a weak song that can be difficult to identify. Roberts (1932) aptly described its song as “one of the humblest of the group,” “a simple, rather weak trill.” For instance, the many records of the Palm Warbler by the MBS is likely due, in part, to their focus on rare habitats such as muskeg and open peatlands. These habitats are also where Palm Warblers are commonly found. In addition, the MNBBA had a relatively large number of records because participants were encouraged to search rare habitats within a priority block. Interestingly, Cutright et al. (2006) found a similar result for the Palm Warbler during their breeding bird atlas in Wisconsin. They stated that, in response to the dearth of information on its presence and habits during summer in Wisconsin, “Kumlien and Holister (1903) went so far as to declare that there is no evidence that it is ever a summer resident in the state, even in the most northern counties.” However, the Wisconsin breeding bird atlas found confirmed nesting throughout the northern tier of counties and as far south as Portage County. Walkinshaw and Wolf (1957) also pointed out that evidence of its nesting in Michigan and Wisconsin had “only accumulated in recent years.” This species can be easily overlooked, and finding nests is a very challenging task that requires enduring patience. Surprisingly, Wilson (2013) makes no mention of any changes in the distribution of this species in his review of the Palm Warbler in North America. Breeding distribution of the Palm Warbler in Minnesota based on the Breeding Bird Atlas (2009 – 2013). Summary statistics of observations by breeding status category for the Palm Warbler in Minnesota based on all blocks (each 5 km x 5 km) surveyed during the Breeding Bird Atlas (2009-2013). Summary statistics for the Palm Warbler observations by breeding status category for all blocks and priority blocks (each 5 km x 5 km) surveyed during the Minnesota Breeding Bird Atlas (2009-2013). Palm Warbler nesting habitat is one of the easiest to identify among Minnesota’s warblers (Figure 4). Most modern descriptions emphasize open peatlands with scattered, low-statured tamarack or black spruce trees, commonly with dense shrubs (1–2 m), and ground cover of Sphagnum moss (Welsh 1971; Erskine 1977; Cutright et al. 2006; Wilson 2013). MNBBA during the point counts almost exclusively detected the Palm Warbler in bogs with the only other detections in lowland coniferous forests and in shrubby wetlands (Figure 5). The National Forest Bird (NFB) Monitoring program also indicated the species almost exclusively uses black spruce-tamarack forest cover types with much lower use of regenerating conifer and sedge cover types (Niemi et al. 2016). Descriptions of habitat use in the Red Lake Peatland of northern Beltrami County identified primary use of muskeg habitat (Niemi and Hanowski 1992). Recent extensive surveys in the Agassiz Lowlands Ecological Subsection confirmed its use of stagnant black spruce-tamarack bog forest cover types in the Agassiz Lowland Ecological Subsection of northwest Minnesota (Bednar et al. 2016). As part of the same study, habitat and landscape modeling by Zlonis et al. (2017) found stagnant black spruce/tamarack habitat to be the dominant feature in predicting the presence of the Palm Warbler. The study by Zlonis et al. (2017) suggests some sensitivity of the species to landscape context. Grinde (2015) found that Palm Warblers were more prone to local extinction in a landscape matrix with small patch sizes of suitable habitat. This was supported by Delage et al. (2000), who found that Palm Warbler populations increased with the size of patches of vegetation in mined bogs in Canada. Typical breeding habitat of the Palm Warbler in Minnesota (© Gerald J. Niemi). Habitat profile for the Palm Warbler based on habitats within 200 m of point counts where the species was present during the Minnesota Breeding Bird Atlas (2009-2013). Partners in Flight (Rosenberg et al. 2016) estimated a global population of 10 million breeding adults; Canada (Environment Canada 2011) estimated a population range of 5–50 million adults. MNBBA estimates from randomly distributed point counts in Minnesota suggested a breeding population of 620,000 adults, or about 6% of its global population, but the estimate was highly variable and should be interpreted with caution. Environment Canada (2011) emphasized that the Palm Warbler was abundant and widespread throughout Canada’s boreal forest east of the Rocky Mountains. Janssen (1987) refers to the Palm Warbler as a “common to abundant spring and fall migrant” in Minnesota, which provides evidence of larger populations to the north. The Palm Warbler was also poorly monitored on 9 forest stands in the Chippewa National Forest as part of the NFB program. Its trend was insignificant among these 9 stands (Figure 7). Across all habitats monitored by the NFB program, the Palm Warbler was 10 times more abundant in the Chippewa National Forest, where mean densities were 0.60 pairs per 40 ha compared with 0.05 pairs per 40 ha estimated in the Superior National Forest. Within specific warbler habitats, detections were still very low. Relatively high densities in the Agassiz Lowland Ecological Subsection in northwestern Minnesota included averages of 0.22 pairs per 40 ha in stagnant black spruce-tamarack bog cover types (Bednar et al. 2016). 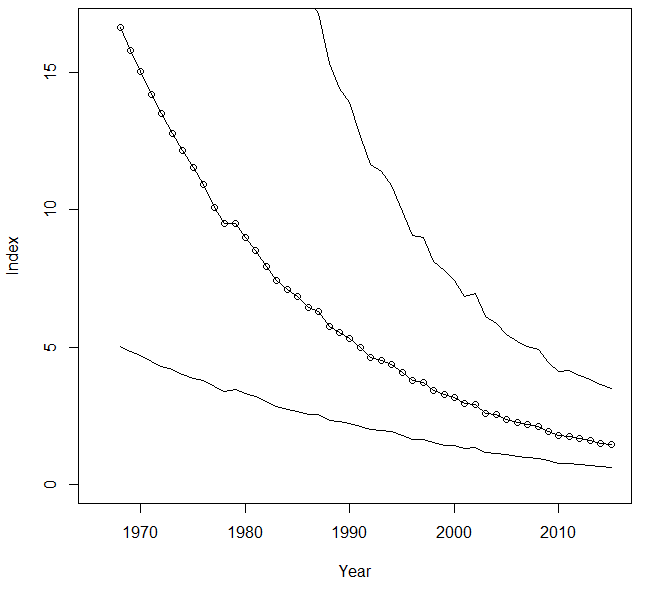 Breeding population trend for the Palm Warbler in Manitoba for 1967–2015 based on the federal Breeding Bird Survey (Sauer et al. 2017). 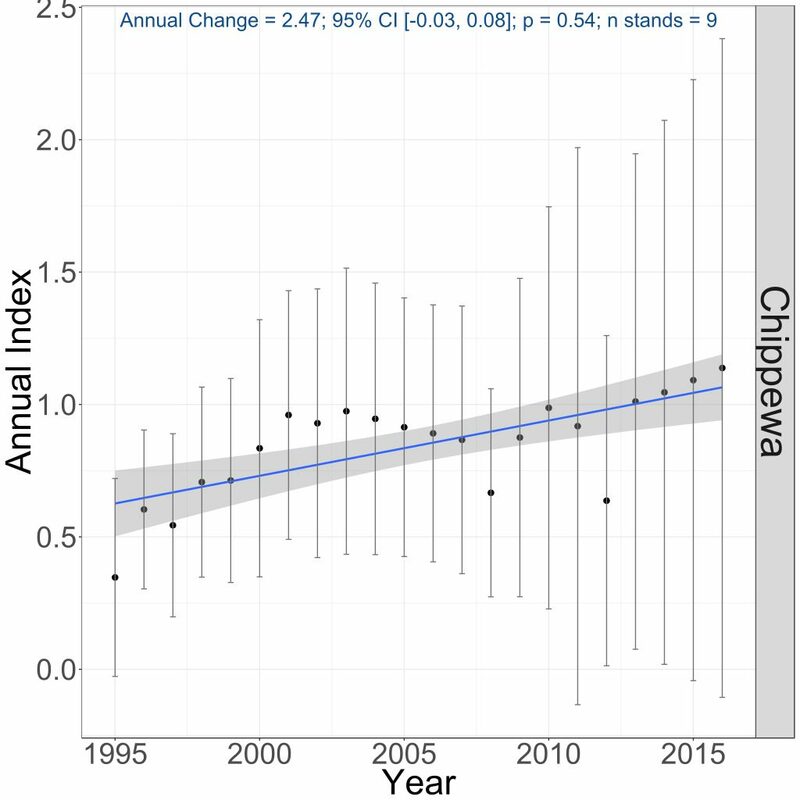 Breeding population trends of the Palm Warbler in the Chippewa National Forest in Minnesota for 1995–2016 (Bednar et al. 2016). The Conservation Concern Score of 11/20 by Partners in Flight (Rosenberg et al. 2016) and the estimated decline in population raises concerns about the status of the Palm Warbler. However, Environment Canada (2011) stated that few threats to the species are currently known about either the breeding grounds or the wintering grounds. They labeled the Palm Warbler as secure and showing a moderate increase in its breeding population since about 1970. This statement conflicted with the Partners in Flight (Rosenberg et al. 2016) estimate of a declining population. In the same document, Environment Canada (2011) highlighted concerns about the loss of bog habitat in Quebec from the peat industry (Desrochers et al. 1998). Related to human interference, Wilson (2013) stated the Palm Warbler is “one of the most frequently killed species in collisions with TV towers and other tall, lighted structures.” Longcore et al. (2013) documented its sensitivity to tower collisions by ranking it as the seventh most frequently killed bird species in the Southeastern Coastal Plain and ranked it eighth in the Peninsular Florida Region. In its review of climate sensitivity for North America, Langham et al. (2015) and the National Audubon Society (2015) labeled the Palm Warbler as “climate endangered.” The society emphasized this species has a very northerly distribution and predictions for future breeding habitat would be on the now treeless Arctic tundra. In Minnesota, the Palm Warbler is likely to be among the first species to be extirpated from the state if climate change continues because of its northerly distribution. Overall, the status of the Palm Warbler in North America is very concerning, especially with its declining population. Because most of the breeding population exists in Canada, the most fruitful efforts are likely to be focused in Canada during the breeding season. However, a better understanding of its migratory routes, stopover habitat, and wintering grounds is warranted. Delage, Valèrie, Marie-Josèe Fortin, and Andrè Desrochers. 2000. “Effets de lisière et d’isolement des habitats d’oiseaux chanteurs dans les tourbières exploitées” [Effects of peripheral and isolated locations of songbird habitats in mined bogs]. Écoscience 7: 149–156. Desrochers, André, Line Rochefort, and Jean-Pierre L. Savard. 1998. “Avian Recolonization of Eastern Canadian Bogs after Peat Mining.” Canadian Journal of Zoology 76: 989–997. Walkinshaw, Lawrence H., and Mark A. Wolf. 1957. “Distribution of the Palm Warbler and its Status in Michigan.” Wilson Bulletin 69: 338–351. Welsh, Daniel A. 1971. “Breeding and Territoriality of the Palm Warbler in a Nova Scotia Bog.” Canadian Field-Naturalist 85: 31–37.